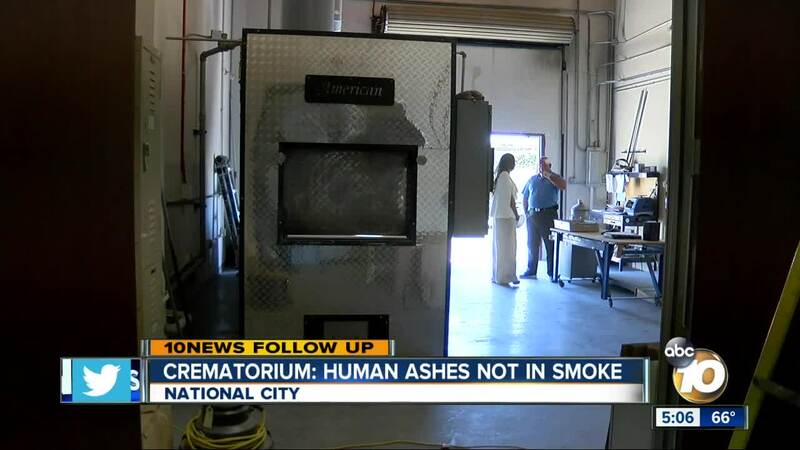 NATIONAL CITY, Calif. — A National City crematorium owner denied Friday that human remains were released into the air during a furnace emergency at the facility. National City firefighters responded to a call Thursday afternoon at the Cortez Family Crematorium, located about 10 minutes south of San Diego. A furnace door was open while the system was operating, triggering the building’s heat detectors. A plume of smoke rose from the building and drifted east. A National City Fire captain and the San Diego Air Pollution Control District indicated human remains were released into the air along with chemicals, the crematorium owner disputes the information. Angela Cortez of the Cortez Family Crematorium says the human remains were covered with a cardboard box at the time of the emergency. The box caught fire due to ambient heat in the furnace and the remains were not burned, she said. Firefighters reset the system, which shut the door and the cremation resumed. The San Diego Air Pollution Control District said there was no public health risk from the smoke. The California Cemetery and Funeral Bureau says it is investigating the situation. Cortez Family Crematorium has been operating since 2014 and has no record of violations, state officials said.